Dimensions 0.50 by 8.25 by 12 in. 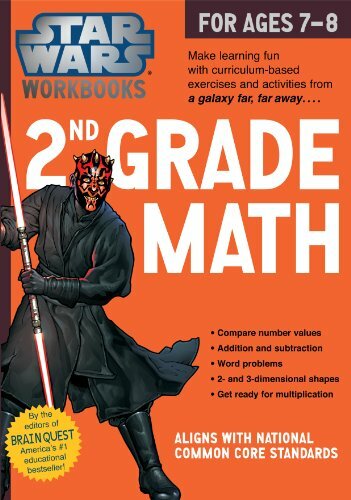 Star Wars Kindergarten Math Skills, for Ages 5-6 | Star Wars Workbook - Grade 1 Math! | Star Wars 1st Grade Reading, for Ages 6-7 | Star Wars 1st Grade Writing, for Ages 6-7 | Star Wars 2nd Grade Reading, for Ages 7-8 | Star Wars 2nd Grade Writing, for Ages 7-8 | Star Wars Kindergarten Phonics & ABCs, for Ages 5-6 | Kindergarten Writing & ABCs | Star Wars Workbooks - Preschool ABC Fun! Twelve titles launch the seriesÃ¢ÂÂthree each for Pre-K through 2nd GradeÃ¢ÂÂand dig deep into core subjects, including numbers, ABCs, phonics, and reading readiness for younger grades, and math, reading, and writing for the older ones. The material, which aligns with national Common Core State Standards, is designed to reinforce essential concepts and lessons taught in schools. Any child, not just fans of Star WarsÃ¢ÂÂbut yes, those fans will be especially delighted (as will reluctant learners)Ã¢ÂÂwill love the Ã¢ÂÂAÃ¢ÂÂ is for Anakin approach to phonics. Kids will practice learning numbers by counting and circling X-wing starfighters and clone troopers. Master place values by sorting groups of Wookiees. There are math problemsÃ¢ÂÂYoda is holding 7 lightsabers. 5 of the lightsabers are blue. The rest are green. How many green lightsabers is he holding? And Language ArtsÃ¢ÂÂCircle the correct homophone in this sentence: Luke is a Jedi knight/night. About: The Force is strong with this series!